French modern period New Wave style advertising poster for Perrier by Bernard Villemot. 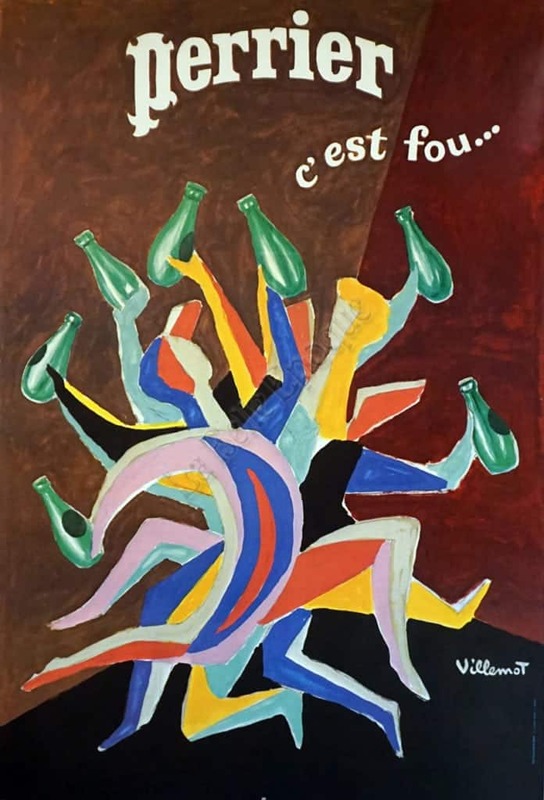 It is an exquisitely crafted and wildly colorful abstract image of the figures of a man and a woman with arms and legs moving wildly in a frenzy with hands each holding an iconic Perrier bottle. The colorful pallet of red, green, pink, yellow, blue, black and white against a background of brown, black and cranberry is an outstanding creation. The Perrier logo is written on the top of the image with C’est Fou to the right which translates to – Its crazy!